This course covers adult, child and infant CPR, AED, along with basic First Aid. It provides first responders with training in CPR basic first aid procedures, including the first aid skills recommended by OSHA. *This is an American Safety & Health Institute certified course. 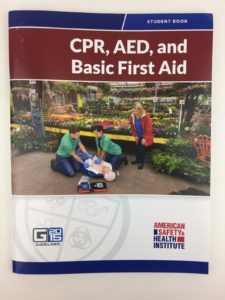 It is an excellent choice for both the community and workplace setting, and conforms to the 2015 AHA Guidelines Update for CPR, ECC, and First Aid. This class is NOT for Healthcare Providers. If you are in the medical field you need the BLS class.